Gratitude is built into San Francisco’s Hidden Garden Steps—as it is with any community-based, volunteer-driven collaboration that transforms an eyesore into a place where neighbors and visitors from all over the world routinely meet, chat, relax, and dream. Together. Anyone spending time on those ceramic-tiled steps today—the second anniversary of the formal ceremony celebrating completion of the mosaic designed and fabricated by project artists Aileen Barr and Colette Crutcher here in San Francisco’s Inner Sunset District—is bound to see a wonderful intersection of gratitude, community, and cause for celebration. The signs of gratitude begin at the foot of the Steps, where a bronze plaque reminds visitors that a group of neighborhood volunteers, along with more than 600 donors and numerous community partners, formally presented the mosaic and gardens as “a gift to the City of San Francisco.” Gratitude is overtly on display just above the largest landing on the project—at the top of the fourth set of Steps as we ascend from Kirkham toward Lawton Street—where a large ceramic passion flower expresses formal gratitude to the numerous project supporters who provided time and services to help bring the project to fruition. And gratitude is expressed nearly every day not only by those who see volunteers who continue to work together to clean the site and expand the gardens, but also by those of us in the neighborhood who have a wonderful outdoor version of what Ray Oldenburg described as a “Third Place” in The Great Good Place: Cafés, Coffee Shops, Bookstores, Bars, Hair Salons and Other Hangouts at the Heart of a Community—that place where we can just show up and know that we’ll see members of our extended community willing to take the time to stop, talk enjoy the site, and meet numerous other people drawn by the site’s beauty and tranquility. 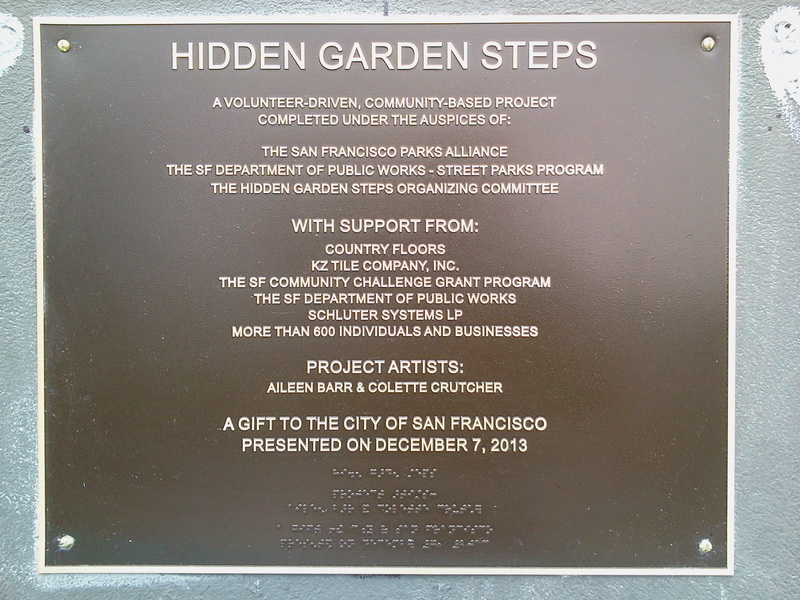 There are plenty of partners to acknowledge—not the least of whom are our predecessors who inspired us by creating the 16th Avenue Tiled Steps Project with the same two artists five years before we began working on the Hidden Garden Steps—as I noted during a brief presentation at the dedication ceremony on December 17, 2013. And there’s plenty of cause for continuing to acknowledge, thank, and celebrate the contributions of those numerous partners in community-building. We still see a group of neighbors—including a few who served on the project organizing committee—on the Steps every Friday morning to sweep them from top to bottom so weekend visitors will see the site at its best. We also see the volunteers who work onsite from 1 – 3 pm on the second Saturday of almost every month (the exceptions are when rain prevents onsite work) to maintain and expand the gardens adjacent to the Steps—a group that has, over the past couple of years, included drop-in volunteers from other parts of the city as well as from France and Japan. Our partners in the San Francisco Department of Public Works have returned to the site several times for continuing work including additional erosion-control retaining walls and work to resolve long-term drainage problems resulting from blocked pipes underground; they have, at times, been supported by colleagues from the San Francisco Public Utilities Commission. There are, furthermore, what I lovingly call the “guerilla volunteers,” those neighbors who, without prodding from anyone else, show up at various times to sweep, pick up the occasional piece of letter left on the Steps or in the gardens, or simply tidy up an area in need of attention. And there are the neighbors who, without complaint, show up to quickly remove the rare bit of graffiti left by those apparently unaware of how dedicated many of us are to keeping the site pristine and welcoming. But the often unacknowledged partners in this wonderful ongoing project are those of you who visit once, twice, or many times. Your presence on the Steps and in the neighborhood overall have contributed to a sense of positive street life and community that was barely visible before the Hidden Garden Steps project began—which, more than anything else, is a tremendous cause for celebration and gratitude in a city where we have plenty worth celebrating—including a third (Flights of Fancy) and fourth (Lincoln Park Steps) set of ceramic tiled steps. N.B. : Numerous articles documenting the Hidden Garden Steps project remain available on this Building Creative Bridges blog. Steps updates can be found on the Friends of the Hidden Garden Steps blog. Stories provided by donors to the Hidden Garden Steps project continue to be added to the project website by Steps volunteer Liz McLoughlin, and a step-by-step virtual tour created by McLoughlin and by project volunteer Gilbert Johnson also continues to grow, with 110 of the 148 individual steps currently included on that online tour. This entry was posted on Monday, December 7th, 2015 at 5:32 pm and is filed under hidden garden steps, volunteers. You can follow any responses to this entry through the RSS 2.0 feed. You can leave a response, or trackback from your own site.